The Actors Of Dionysus visited The Aldridge Studio of Salford's Lowry Theatre and performed their 70 minute non-stop one act reworking of Sophoclese's Antigone to a capacity audience. The Actors Of Dionysus are well known for their work with both the ancient classics and bringing these into the spotlight, making them relevant for today's youth. This production was no different, and indeed, for the audience made up by the vast majority of school students studying this text at A-level, then it certainly ticked all the boxes. It was the right length to keep them engaged, with no interval for them to lose concentration; it was modernised and simplified beyond textual recognition; the plot and themes were drummed into us; and the whole presented very much in the way I remember student experimental presentations were thirty plus years ago! However, for those older and perhaps more discerning audience members going to watch a production of Sophoclese's Antigone, then they quite understandably were justified in feeling a little cheated. I overheard one of them use the term, 'high class TIE' and despite the simplicity of this phrase it somehow seemed apt and appropriate. [TIE stands for Theatre-In-Education and more often refers to small scale theatre companies who tour their educational-based plays into schools themselves]. That is not to say that the presentation wasn't enjoyable nor good. It was both; and the 5 actors who multi-rolled and carried the story, were well chosen. 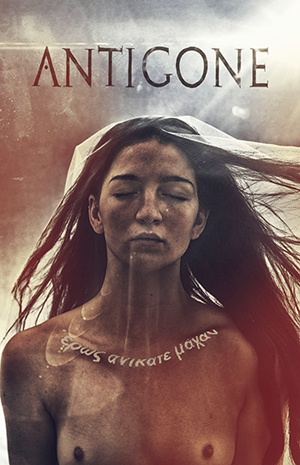 The basic story of Antigone was unaltered, but in this version we are given a dystopian unnamed city where laws are made by entering them into a giant computerised database and flying drones take video footage of events. Costumes and staging mirroring this tragic and military theme with dark clothes, strange lighting [sometimes bright and sometimes only semi-lit within the same scene], and two large curved grilled fences which were used - maybe over-used - quite effectively throughout. To compliment all of this, the play had been completely re-written by Christopher Adams with enough modern references [some of which really worked] to make sure their target audience stayed with them. Nathalie Barclay played Ismene, Antigone's older sister with unerring sincerity and for me at least was the most natural and believable of the troupe; whilst Antigone herself was played with stoic stubbornness by Holly Georgia. Creone, the ruler of this city was Nicholas Cass-Beggs. Sadly I never really quite believed him, nor was I able to fully empathise with him, and his emotions never seemed quite real. Perhaps too rigid and controlled. Fortunately though his characterisation never relied on caricature unlike Crystal Brown who played both his wife, Euydice and a Jamaican patois speaking Tiresias; appealing very much to the younger audience members but for me at least was unfortunately the weakest link in the chain because of it. And finally, the 'normal' one caught up in all the madness and tragedy around him, was Haemon, son of Creone and madly in love with Antigone, played very sensibly by Will Bridges. All five and pre-recorded offstage voice (the database) played the 'chorus'. Directed by Tasmin Shasha, this play did exactly what it set out to do... bring the play bang up to date and widen it up to a young and perhaps non-theatre going audience. It was entertaining and I was not bored at all by the play; however it did feel a little as if I had inadvertently walked in on a first year drama school project.